Kitchen countertops make a big visual impact in the kitchen right as the kitchen cabinets cannot be complete without them. 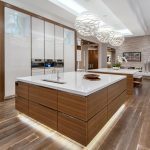 When making a choice for kitchen countertops, it is important that they match and complement the cabinets otherwise there is visual disharmony. How can you pick the right countertops? There are two ways of picking the color of the countertop. Contrasting countertops highlight the cabinets, for example, a dark brown stained cabinet can go with a lighter colored tan countertop. Contrasting colours are a popular choice for modern kitchens and contemporary kitchen design. You can also opt to create a unified look by picking a countertop matching the color of the cabinet. If you have white cabinets, white marble countertops would create a harmonious clean look. The type of lighting in the kitchen should also be factored when picking countertops. Contemporary styling with stylish hues and tones will go well with contemporary countertop material like colored glass. Different materials have different degrees of durability. Marble has become wildly popular for its soft colors and interesting vein patterns. However, it is not very durable in a heavy use kitchen as it wears out easily. Granite has long been preferred in busy kitchens because of its ability to withstand wear and tear. It is also resistant to staining and easy to wash especially when sealed. Quartz is just as hard as granite but offers more variety in color and patterns. For this reason, it comes at a higher price. Countertop materials can be dirt cheap at one end of the price spectrum, and outrageously expensive at the other end. The cheapest materials are those industrially produced composites like Formica and laminate. While these materials offer variety in color and patterns, they are flimsy and are easily damaged by heat. Tile is also cheap but offers better heat resistance than the laminates and Formica. But tiles withstands shock poorly and are prone to breaking and chipping. Granite is a mid-priced countertop material. It is readily available and offers longevity. Quartz is also durable but more costly than granite. Porcelain is just as attractive and costs equally to quartz. Other mid-priced materials include hardened glass. At the other end of the price, spectrum are exotic marbles with the most popular being Carrara and Calacatta marble which cost hundreds of dollars per square meter. 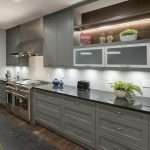 Whatever choice you need or have of countertop material, there will be experts to help you by explaining the pros and cons of different countertop materials for different needs. Pick the correct countertop to complement your cabinet and impress your guests hugely.